I would like to build a weather vane to show the direction of the wind on a display inside my shop. Ideally, it would have LEDs to indicate at least eight wind headings. Instead of a mechanical contact at the vane, is there a simple circuit to indicate the position of the vane? 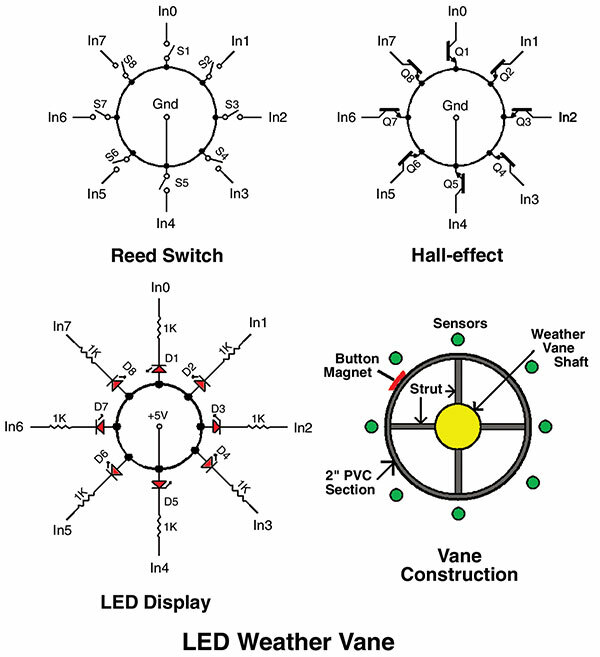 Perhaps a series of Hall-effect components have to be used? I’m not sure if I understand the Hall-effect components correctly, but I’m open to anything and willing to try (read: limited electronic, self-taught, hobby education). Welcome to the world of self-taught hobby electronics. The road is bumpy, but filled with lots of serendipity detours that lead to exciting discoveries. 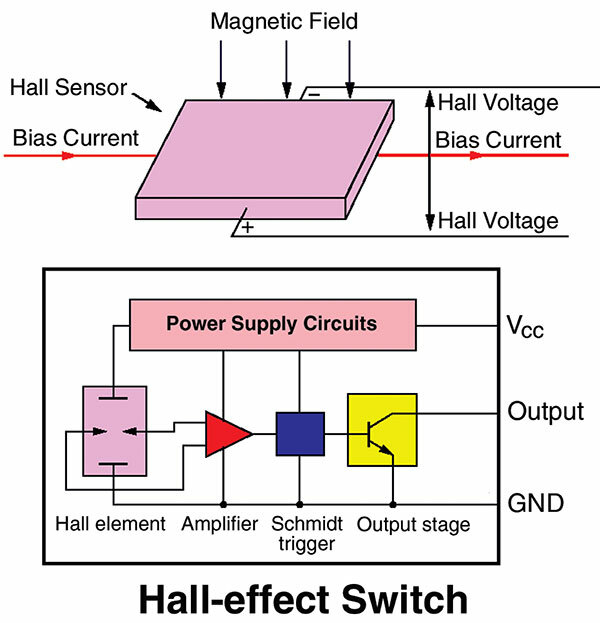 Let’s start with the Hall-effect. In operation, a constant bias current is passed through the Hall sensor. In this mode, the current (flow of electrons) is evenly distributed across the chip. With an equal number of electrons at the chip edges, no voltage exists at the output. When the Hall sensor is placed in a magnetic field, the electron flow is forced to one side of the chip causing an imbalance in the electron concentration at the edges. This creates a voltage output that is detected and amplified to switch on an output transistor. The weather vane sender can be connected to the LED display via a CAT 3 or CAT 5 communications cable. However, this can get expensive on long runs. A solution is to encode the eight inputs into BCD code and send it over the twisted pairs of cheap telephone wire, then decode it back to the original eight outputs. I hope you have learned something and had fun doing it at the same time. Have fun with your weather station!